For more than 50 years, lovers of that famous mouse named Mickey have been heading to Anaheim, California to spend a few days amidst the fantasy of all things Disney. Walt Disney was 53-years-old when he realized his dream of building a park where "age relives fond memories of the past and youth may savor the challenge and promise of the future." Officially opened on July 17, 1955, all was not rosy during the early days of Disneyland park, especially on opening day, when 6,000 guests were invited but 28,000 showed up for the festivities! Rides broke down, streets leading to the park were jammed, and shoes sank into the still-soft concrete! 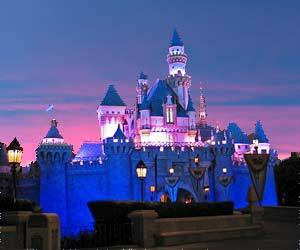 But, before long - and in inimitable Disney fashion - the staff and Imagineers at Disneyland had everything under control and the park soon became one of Southern California's most popular tourist destinations. Today, the popularity continues, thanks to Disney's universal appeal and the company's dedication to keeping Disneyland new and fresh, not only with the addition of new rides but also a whole new park (California Adventure) and the Downtown Disney district where visitors can shop, dine, and even enjoy nightlife a la Disney.